Addison Russell #27 of the Chicago Cubs is seen on the bench before a game against the Colorado Rockies at Wrigley Field on June 9, 2017 in Chicago, Illinois. 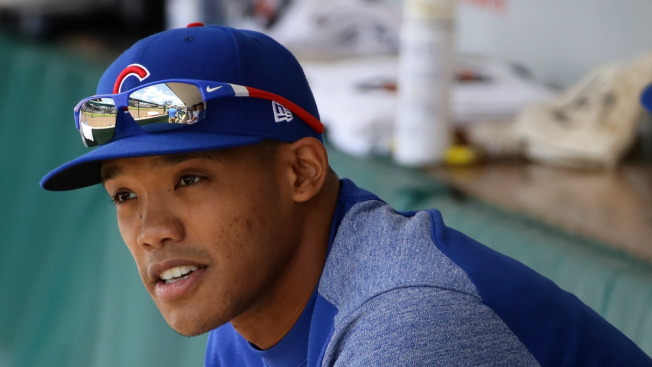 After a highly-publicized Instagram post that accused her husband of infidelity, the wife of Chicago Cubs shortstop Addison Russell has filed for divorce, her attorney announced Wednesday. Melisa Russell hired an attorney to represent her in divorce proceedings, according to a press release issued by her attorney’s law firm. “It is her desire to pursue a resolution that is, first and foremost, in the best interest of the parties’ son, and which occurs in a swift, amicable, and private fashion,” the statement read. In an Instagram post published in early June, Melisa Russell accused her husband of infidelity. “Being free to be able to make your own choices for your own happiness beats being cheated on, lied to, and disrespected every day,” the since-deleted post read. Melisa Russell’s attorney also announced that his client declined an invitation from Major League Baseball to talk about the domestic violence allegations made by one of her friends on the deleted Instagram post. The allegation that the shortstop mentally and physically abused his wife was reportedly under investigation by the league as part of its sweeping powers to impose discipline for domestic abuse allegations and charges. The Cubs’ shortstop denied the accusations. “Any allegation I have abused my wife is false and hurtful,” Russell said after the post was published. MLB has not made any announcements on potential discipline for Russell, or if an investigation is taking place. The shortstop missed one game for the Cubs after the allegations broke, but returned to the team’s dugout the following night.